Barcode Warehouse carries thermal transfer jewelry labels for use in in all industrial printers that utilize a 3" core label. Our labels are available in an economical polypropylene material as well as our gloss supreme polyester (mylar) for exceptional protection through ultrasonic cleaning. 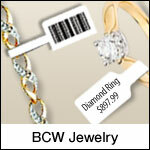 All BCW thermal transfer jewelry labels feature an Adhesive Free Shank eliminating any adhesive buildup on the jewelry. BCW TT jewelry labels are specially treated with UV shield to provide excellent resistance to ultra violet light. Use with BCW Resin ribbon.